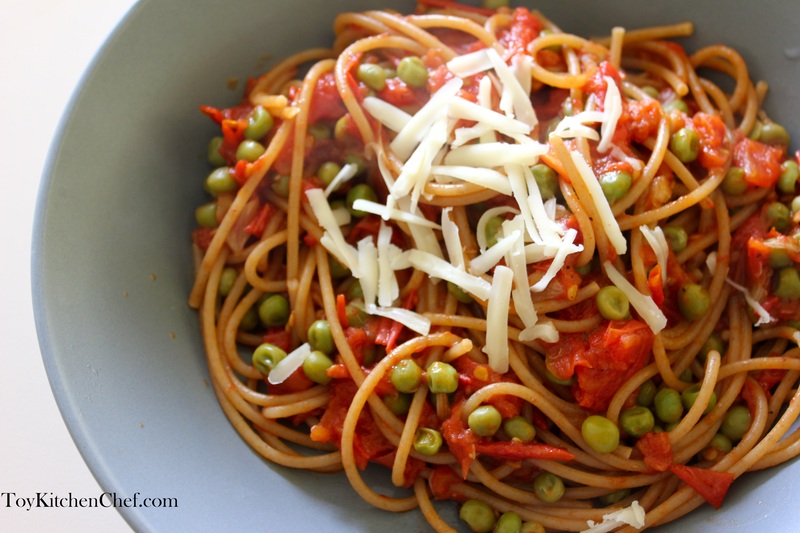 Summer tomatoes and peas make the perfect pasta sauce pairing. 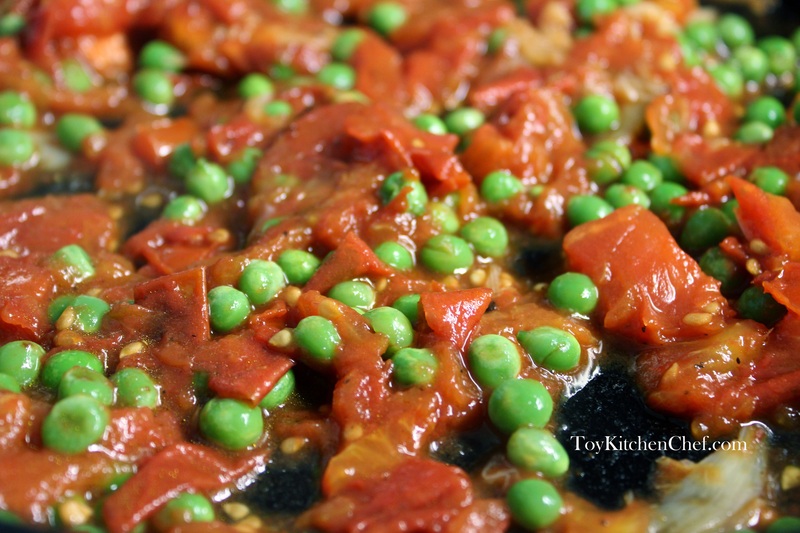 I am a huge fan of tomatoes (and peas), both as a base for various dishes and in sauces on their own. Since I tend to eat them in everything, it can get old always having the same old sauces. This is why this time I decided to roast the tomatoes (and garlic!) for a different flavor. Plus, it’s super fun to cook them up in your oven and listen to them crackle and sizzle – entertainment in its own right. On a completely unrelated note, last week Kelly in the Kitchen very sweetly gave me the Versatile Blogger Award! Thanks so much, Kelly (check out her blog, too)! As tradition goes you are supposed to give the award to 15 other people. While I do understand that if I give the award to 15 people and they give it to 15 more people and so on eventually the number of people with the award becomes infinite, I’d still like to pass it on. Reading other blogs is one of my main sources of inspiration and I’m always impressed with what people come up with in their recipes, stories, photos, and layouts. Plus, I think it’s important to support other bloggers in what they do and in the time and effort they put into their sites. Below are a list of blogs that I really enjoy and would like to pass the Versatile Blogger Award to. I hope you’ll read and follow their blogs as well! Jono and Jules Do Food and Wine – I basically want to be this couple when I grow up. Their recipes are always simple and elegant, I have made a few and really enjoyed them. What to Cook? – I often wish that I could be better at menu planning (and therefore grocery strategizing). This blog makes it look easy and makes me think that maybe it’s a skill I’ll be able to develop. There are just a few of my favorites. I hope you’ll check out their pages and support them as well! Happy cooking! Don’t have normal tomatoes? Use cherry tomatoes instead! Preheat your oven to 400 degrees. Wash your tomatoes, dice and add to a bowl. Leave behind some of the juice on the cutting board. Once in the bowl, add about ½ tbsp olive oil and a few shakes of black pepper. Mix well. Take a baking pan or baking sheet and place tomatoes inside (keep extra juice in the bowl). Peel your garlic and add to the baking sheet. Place into the oven. If you are using frozen peas, remove them from the freezer and place into a bowl of warm water until they unthaw. To prepare for the pasta, add water and salt to a medium or large pot and bring to a boil. Take a large or medium pan and add about ½ tbsp olive oil. 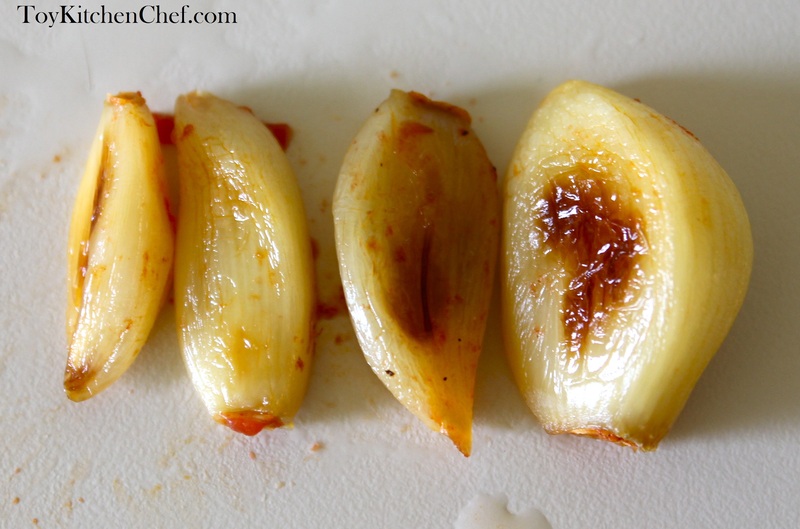 Remove garlic from oven and when it is cool enough to touch, pull it apart with your fingers. Add to the pan and bring to low heat. 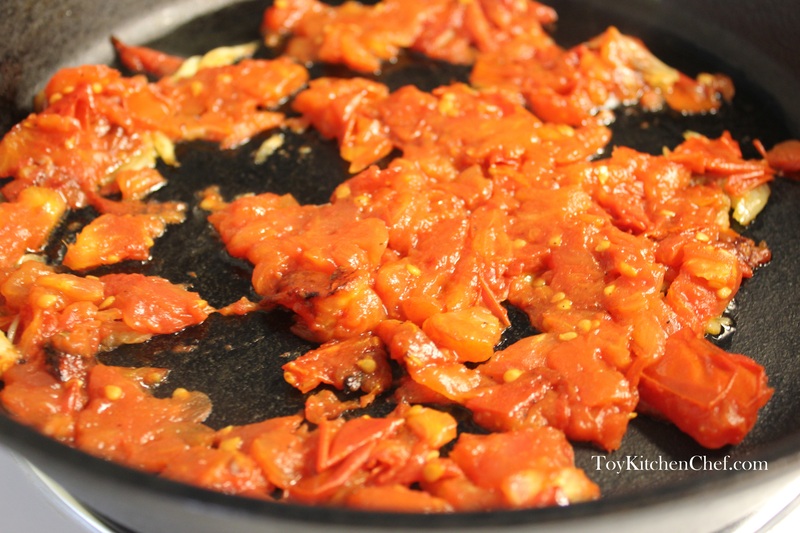 Remove tomatoes from oven and add to the pan. Add extra juice. Let simmer for 2 minutes. Drain and add your peas. Add pasta to water and cook just shy of al dente (firm but not uncooked). Drain and add to the sauce. Let it finish cooking there for about 2-5 minutes, or until at the desired softness. If the sauce gets too dry, add some of the extra pasta water. Serve with cheese and enjoy! Thanks for the mention! The pasta looks delicious, and I’m not even a pasta fan! yum. roasted garlic makes everything better!